As the cold weather begins to creep in, and a new exorcism movie is making the rounds, I can hear the comforting call of a nice hot pot of pea soup. 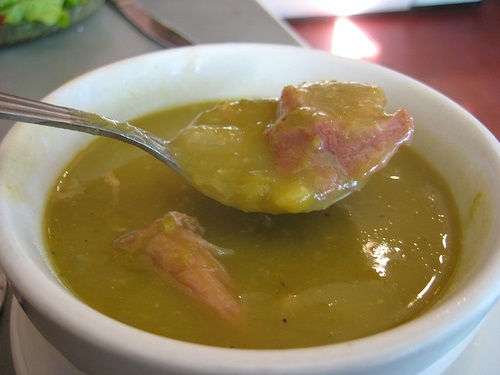 Yes, there is no greater friend to a ham hock than a piping pot of split peas. Pick over the peas and remove any stones. Wash and drain peas. Place in a 4 quart pan with the vegetables ham hocks and 2 1/2 quarts of water. Bring to a simmer. Skim the top of the soup for several minutes clearing the froth that floats along. Cover and simmer about 1 1/2 hours until peas are tender, stirring occasionally in case they stick to the bottom of the pan. Remove the ham hocks from the soup. Purée the soup with a blender; I use my immersion blender right in the pot, its great for this; if you are using a regular blender, take care to work in batches and only fill the blender halfway if the soup is still hot, and hold down the lid while blending. If you want an exceptionally smooth soup, pass the purée through a sieve, but I prefer mine a bit on the lumpy side. Remove the skin from the hocks and dice up the meat. At this point you can scour the fridge for any left over ham bits and pieces. This is one really good soup for using up those porcine scraps. Add salt and pepper to taste. Ladle into warm bowls. I like to serve this with fresh warm pumpernickel bread.